William Blake was the messiah of the imagination; in poem after poem he reached the everlasting gospel of the intellect and will; a once-in-a-lifetime "original", he lived and died virtually unknown, unhonored. Since the 20th century, however, he's become the grand prix of the illuminati, a legendary figure whose message to mankind is full of, for some, visionary greatness, for others, mystical gibberish. Sarold Bloom, one of Yale's up-and-coming faculty men, clearly belongs with the rooters, and his critique, an elaborate, eminently enthusiastic examination of all the verse, but most especially Milton, Jerusalem and The Four Zoas, should prove a sell-out with Blake scholars and fans. 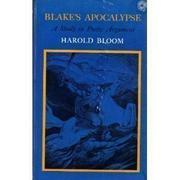 According to Bloom, Blake was insistently apocalyptic rather than biblically prophetic; his tapestry melded the symbolic lands of Beulah and Eden, the transformation of Innocence and Experience, the fall and resurrection of Man, the union of Good and Evil, those creative Contraries. As the forerunner of phenomenological psychology he synthesized the haunted state of lost mythic connections between man and nature, man and himself. Blake's debt to Boehme, Swednborg and Neoplatonism is noted, as is the author's to Northrope Frye, among others. A complex, challenging commentary.